Devotee: Sometimes this question comes up, with the devotees especially, that it says the devotee makes advancement when the spiritual master is pleased. Right? So sometimes the spiritual master is far, far away. He may be in Los Angeles. Somebody is coming to Hamburg temple. He thinks, "How will the spiritual master be pleased?" Devotee: And Krishna knows that; therefore we make advancement. He is sitting in our heart. He knows what we're doing. So He sees, "He's serving My pure devotee," immediately there is advancement. 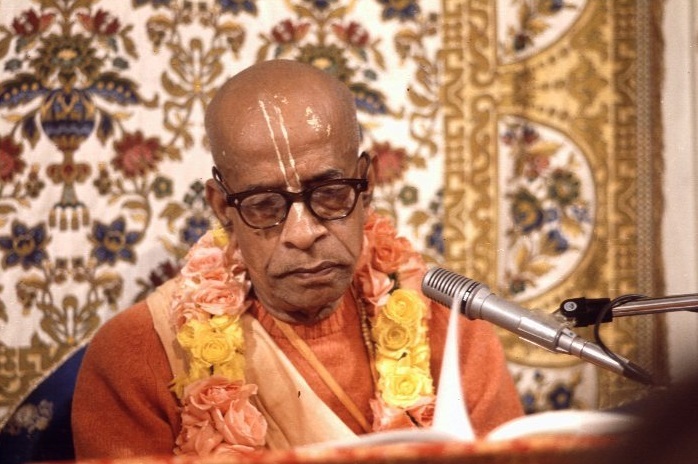 Prabhupada: Yes. Spiritual master... Krishna is not limited. It is not material. You can associate with Krishna and the spiritual master in any circumstance, provided you want two things. Just like we can associate with Krishna immediately if we take Bhagavad-gita as it is. He is not different from Bhagavad-gita. Nama-rupe kali-kale krsna-avatara (CC Adi 17.22). Krishna is incarnated in His name in this age. You associate with Krishna's name, immediately associate with Krishna.